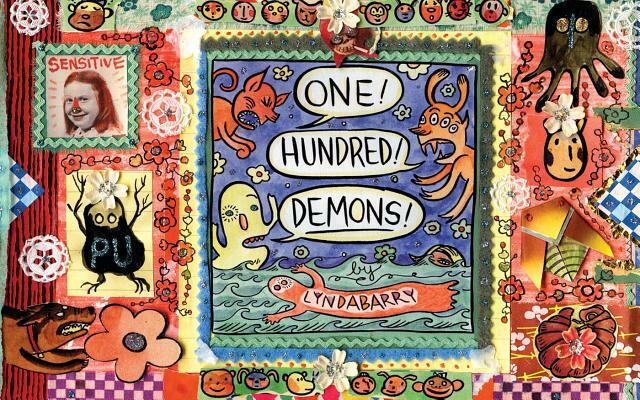 Inspired by a sixteenth-century Zen monk’s painting of a hundred demons chasing each other across a long scroll, acclaimed cartoonist Lynda Barry confronts various demons from her life in seventeen full-color vignettes. In Barry’s hand, demons are the life moments that haunt you, form you, and stay with you: your worst boyfriend; kickball games on a warm summer night; watching your baby brother dance; the smell of various houses in the neighborhood you grew up in; or the day you realize your childhood is long behind you and you are officially a teenager. As a cartoonist, Lynda Barry has the innate ability to zero in on the essence of truth, a magical quality that has made her book One! Hundred! Demons! an enduring classic of the early twenty-first century. In the book’s intro, however, Barry throws the idea of truth out of the window by asking the reader to decide if fiction can have truth and if autobiography can have a fiction, a hybrid that Barry coins “autobiofictionalography.” As readers get to know Barry’s demons, they realize that the actual truth no longer matters because the universality of Barry’s comics, true or untrue, reigns supreme.